I've had this problem on past snaps and would always recover by using older/recent snaps. But this time I have a build that's really nice but with no recent snaps. Using RefractaSnapshot I have the feeling I should be getting an .iso around 2.7G but that's not the case lol. Anyone know a good place to start de-bugging? Last edited by MXKx20 on September 27th, 2018, 2:08 pm, edited 2 times in total. Check /var/log/refractasnapshot_errors.log It's probably an xorriso error. Usual cause is not enough free space. Run 'refractasnapshot -d' or 'refractasnapshot-gui -d' to get a more verbose error log. and then retried a snapshot from the GIU menu(The ubuntu grub-pc file was in the way). The .iso now are 96k and when put onto a usb shows that no isolinux is installed on the drive. It doesn't matter which grub is installed for making the snapshot. That only matters when you're installing, and even if the wrong grub is installed for your hardware (efi vs. bios) the installer will use the right grub packages if you have them on the media. I need to see a debug log to figure out where it went wrong. fsmithred wrote: I need to see a debug log to figure out where it went wrong. There is a 4gb limit on an iso. Start excluding stuff. Note that I haven't been able to get mine under that in a very long time even with all of home excluded. It's been frustrating. I'm sure that fsmithred will have more illuminating comments. golinux wrote: There is a 4gb limit on an iso. Start excluding stuff. WOW. Thank you golinux. Fixed. Deleted A movie. 4gb is the limit for now? Last edited by MXKx20 on November 3rd, 2018, 4:46 am, edited 2 times in total. 4GB is the limit for the iso size. That's not new. If you can't get it down below that size, you can still make a live-usb using what's in the work directory. You have to set save_work="yes" in the config file first. Then make your snapshot. 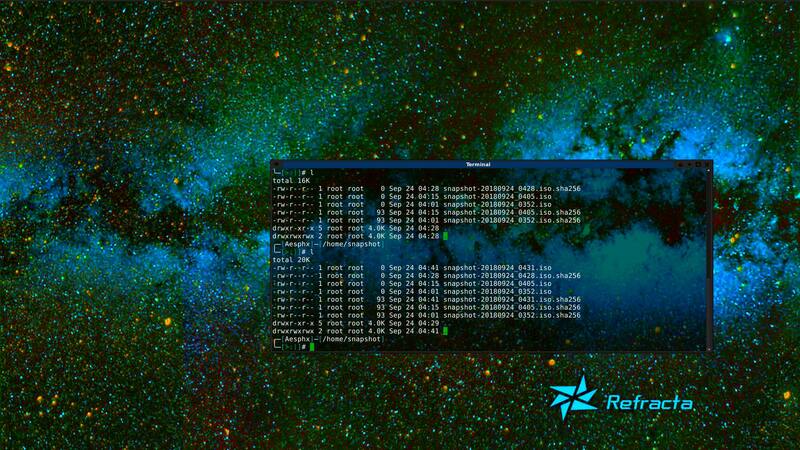 To make the usb, find a small bootable live iso, use refracta2usb to make a bootable live-usb with that iso, then copy the contents of /home/work/iso/ to a new directory on the usb, then edit /syslinux/live.cfg and /boot/grub/grub.cfg on the usb to add an entry to the boot menu. You'll have a multi-boot usb with your custom system and whatever live iso you used for the first system. (I recommend a refracta iso.